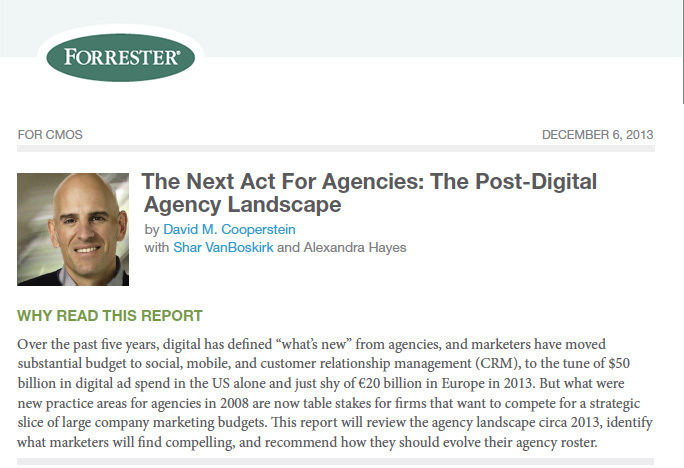 David Cooperstein with Shar VanBoskirk and Alexandra Hayes just published a piece for Forrester Inc. that explores the current agency landscape and recommends how marketers should evolve agency rosters. David Cooperstein cites Roundarch Isobar as an “innovation agency” that introduces transformative ideas. Businesses that face digital disruption need help to out-innovate competitors and to create awareness among empowered consumers. Innovation agencies, like T3, Roundarch Isobar, and R/GA, invent new products and business models.